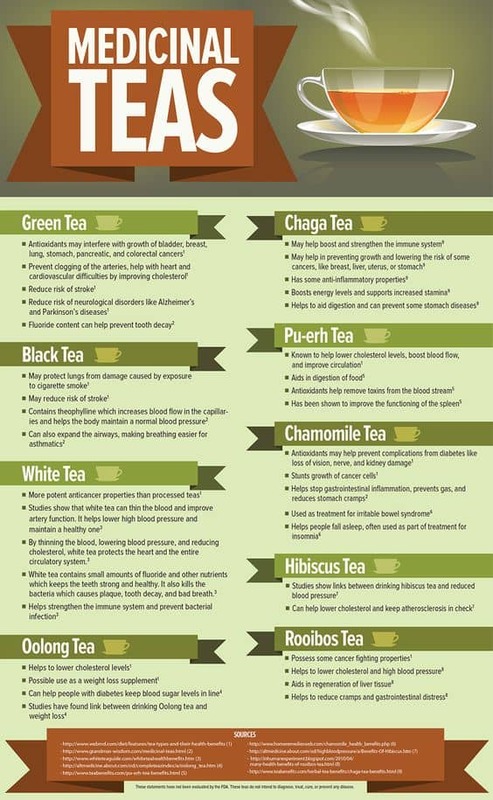 If you are a Tea drinker, you may not be aware of all the alternate varieties that can heal your body and mind naturally. Learn about all the magical remedies now. Did you know that Medicinal Teas have been used since the second century BC? Although nobody is quite certain how it was discovered, Tea is still a favorite drink today and has many beneficial properties, some that you may not even realise. In fact, next to water, Tea is the most widely consumed beverage in the world with a whopping two-thirds of us drinking it. The three main varieties of tea (green, oolong, and black tea) are made from the same plant, Camellia sinensis. The difference in their colors, tastes and properties come from how and where they’re grown. Herbal teas come from a variety of plants and are actually not truly ‘Teas’, but considered herbal infusions. The infographic above from MUIH outlines the endless uses for Teas including calming anxiety and nerves, menopause, morning sickness, indigestion, metabolism to name a few. Now that you are more informed about how how Tea is made, let’s check out the different benefits that you can expect when you mix up your cuppa. This graphic from Sayan Health shows the most popular varieties of Tea and what they can be used for health-wise. As you can see, it’s like having a natural medicinal tea chest at your disposal. Green Tea is well known as one of the most antioxidant-filled teas available. Easily bought at any store, it has been shown to reduce the risk of multiple forms of cancers, strokes, cardiovascular diseases and Alzheimer’s. Black Tea contains theophylline, a special element that can help to increase blood flow in capillaries and normalize blood pressure. It can also help people who suffer from asthma by opening up airways, and might even protect lungs from damage caused by cigarette smoke exposure. White Tea is a wonderful compliment to most citrus flavors and works well blended into other teas. It has some serious anti-cancer properties that can protect your body from multiple forms of the disease and can help strengthen the immune system to boot. It has also been shown to be a powerful antibacterial antibiotic agent, perfect for fighting an oncoming cold. Oolong Tea has been shown to help lower cholesterol and blood sugar. It has also been used in studies and been shown to help produce some weight loss. Chaga Tea is a powerful drink that many people use as a preventative measure to fend off a number of ailments. It has anti-inflammatory properties that help protect the body from infection and disease and has also been shown to aid in digestion. Chamomile Tea is often used as an insomnia treatment, but is full of other benefits too! The tea has been shown to stunt cancer cell growth, help with IBS symptoms and even reduce stomach cramps. Hibiscus Tea can help lower cholesterol and has also been shown to be a promising treatment to help lower blood pressure. Rooibos Tea, also known as “red tea”, can help those who have suffered from liver ailments by aiding in the regeneration of liver tissue. It also helps stomach cramps and gastrointestinal disorders and can help lower blood pressure and cholesterol. It has even been shown to possess some anti-cancer properties. Herbal teas are different from the main varieties of teas since they all come from different plants. Many of them can be grown right in your own garden, and help a wide variety of ailments. They’re so much fun to mix up, experiment with and drink any time of day. Peppermint Tea is a super popular variety of tea amongst home gardeners since its so simple to grow. In fact, it grows as quick as a weed and spreads everywhere! It’s a powerful decongestant, has anti-inflammatory properties and can even help suppress your appetite. Ginger Tea is an easy tea to make, whether you use a tea bag or a fresh root from the store. It has antihistamine properties and is well-known as a great cure for nausea. It’s also got an excellent flavor that can be used along with other teas when you want a nice, strong flavor. 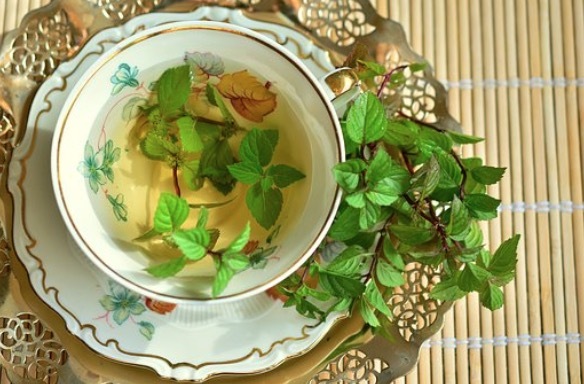 Stinging Nettle Tea might sound dangerous, but it’s actually a great energy booster. It can also help ease joint pain in arthritic patients, and help give relief to those who suffer from seasonal allergies. Yerba Mate Tea is a great alternative to coffee for those looking to make a switch, since it has a big-time stimulant effect. It can also help lower cholesterol and even open up respiratory passages. Lemon Balm Tea has a wonderful citrusy taste. It can help treat headaches and toothaches, alleviate digestive problems and even speed up recovery from the common cold. It also has a wonderful calming effect, making it a great chamomile alternative. Hibiscus Tea has a wonderfully invigorating taste and actually has a pretty high vitamin content. It’s known as a natural diuretic and can help lower blood pressure. Red Clover Tea can be a great help for those suffering from menopausal symptoms. It can also help reduce the risk of heart disease and prostate cancer. Dandelion Tea While these little weeds might not benefit your garden, they can benefit your body! The dandelion tea can help stimulate digestion, lessen hot flashes, combat kidney stone formation and even help in the treatment of hepatitis, jaundice, and dyspepsia. Cinnamon Tea not only tastes amazing but can help boost your metabolism! Its also great for lowering cholesterol, fighting off viruses, and even for alleviating arthritis symptoms. It’s also full of antioxidants. These tea recipes from The Indian Spot give some wonderful ideas and treatments for everyday problems. Whether you’ve got a cold, headache, or are even dealing with some anxiety, there’s a recipe here for you! Turmeric has been having its time in the limelight lately and for good reason! This powerful spice that is typically used in curries and sauces can help fight off inflammation. It is full of antioxidants and can even help speed up metabolism according to Knowledge Weighs Nothing. Given that it is a strong taste, you can make it more palatable by using natural sweeteners like honey and lemon. This will subdue the flavor considerably. 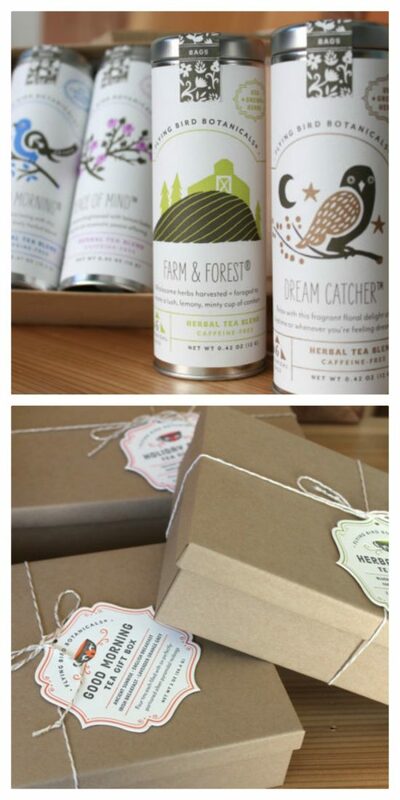 A Pair & A Spare shares her favorite teas for every time of day in this graphic. If you’re new to the tea-drinking habit, it’s a great place to start off. Genevieve enjoys a dose of antioxidants in the morning and ramps her energy with some black tea in the afternoon. She enjoys Chamomile before bedtime for its soothing and calming properties and Ginger Tea is her suggestion for an upset tummy. This great chart from Express Vending shows you how different teas and tisanes (infusions) can help various ailments, aches, and pains. They made their chart by cross-referencing the data on each plant on WebMD’s health database. Quora shows the caffeine content, steep times and perfect temperatures for each kind of Tea. It’s important to note temperatures and steep times for all the different kinds of teas you drink during the day. This will ensure you’re getting the full benefits of the Teas and also the best flavor. Pay special attention to caffeine content too, particularly if you’re sensitive to caffeine, or have high blood pressure or cardiovascular problems. Some Teas contain more caffeine the longer they’re steeped. You’ll need to keep an eye on your watch. 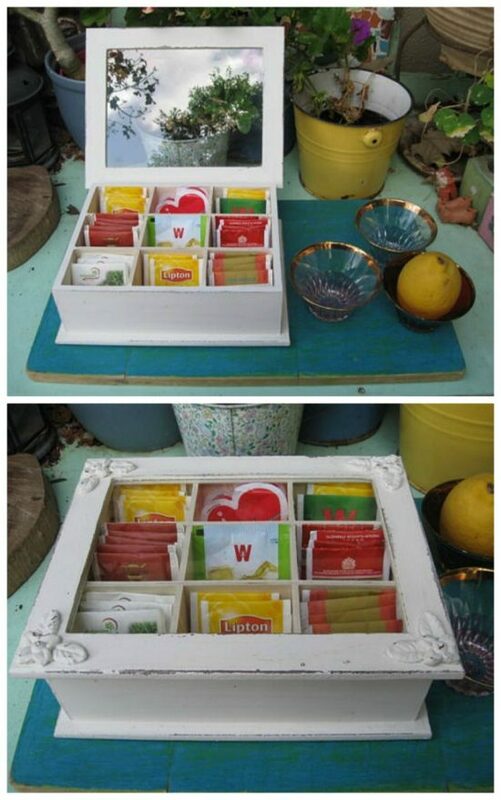 For more ideas check out our Herbal Tea Post here.